I’m a tough customer with many Urban Fantasy titles. I tend to either really like the book, or be bored out of my mind by it, and I struggle with understanding why some UF books rock my world and why others don’t work for me. Luckily, Ferrett Steinmetz’s Flex falls firmly and undoubtedly in the first camp. He takes the “people learn how to do magic, will they use it for good or ill?” question and blows it right open, exposing the soft underbelly of a society that first resorts to fear and violence when faced with something they don’t understand. And I fricken’ loved every word of it. The magic is weird and soul-crushingly expensive, the characters are fantastic, the stakes are high, and the story is intimate. That my friends, is what I’m always looking for. Allow me to set the stage: Insurance agent Paul Tsabo is still in shock over his recent divorce, still trying to make his new apartment look fun and friendly to his six year old daughter Aliyah. An ex-police officer, he lost a foot in the event that brought his police career to a screeching halt. It’s okay though, Paul actually loves doing paperwork and investigating insurance fraud. The stingy insurance company he works for loves him too – he saves them a fortune in paying out claims. After all, if the injury or damage was caused by ‘mancy, it’s not covered by insurance. Paul can sniff out ‘mancy like the best of them, because after all, he is a ‘mancer. He loves the idea that his forms and paperwork can track anything that happens, or anything that someone wants to happen. No one really understands how magic works, but everyone knows three things: Your ‘mancy is directly connected to what you love; physics and magic do not get along and the side effects of ‘mancy are often fatal; and if caught doing ‘mancy you are arrested, mind-wiped, and given a life time membership to the military hive mind. Very few people understand how ‘mancy works, and since it’s illegal to learn about it or discuss it, finding what knowledge does exist is even harder. But what about people who don’t have the natural gift for ‘mancy, people who want the magic of ‘mancy, but don’t want to pay the price? Certain ‘mancers are able to distill their magic into a drug called Flex. When taken by a non-’mancer, Flex allows you to only have the best luck in the world, for everything to go perfect. Depending on the purity of the Flex, the blowback might hit the user, or people around them, or complete strangers. Criminals are huge fans of Flex, let me tell you. The magic in Flex isn’t free, and that is something I really appreciated. ‘Mancy allows incredibly coincidences to occur, and the Universe is not a fan of untethered good luck piled on top of coincidence. The price of making something good happen is that something horrible happens. Your ‘mancy is shaped by what you love, and the blowback chases those same people and things in your life that give you joy. Do magic, and risk what makes your life worth living. How much is Paul willing to risk for Aliyah? He knows he isn’t responsible for the fire that gutted their apartment, but shouldn’t his ‘mancy have been able to get her out of the fire faster? It’s unknown how long she’ll be hospitalized, and the insurance company is digging their heels in deep regarding their refusal to pay for further treatments. She’ll certainly recover from the burns, but Paul worries about how a little girl covered in burn scars will be treated when she returns to school. To save her (and by “save”, I mean convince an insurance company to pay for a plastic and reconstructive surgery for a little girl), he’s got to understand exactly how his ‘mancy works, and fast. His bureaucromancy could save his daughter. But it could just as easily kill her in the process. In an attempt to learn about how his bureaucromancy works, Paul starts working with a young woman named Valentine. As much as i adored Paul, Valentine quickly became my favorite character in Flex. A passionate gamer, she carries videogame levels and lore in her mind along with a pure love of everything that is gaming, fueling her videogamemancy. And here’s where Steinmetz gets even more points for stereotype implosion: Valentine is a “strong female character”, but not the boring, skinny, tattoo’d, knife wielding, handsome man romancing, flowing black hair having, stereotypical Urban Fantasy strong female character. Valentine is chubby. She’s a little socially awkward. She’s a goth. She chooses boyfriends based on kink compatibility rather than how they treat her. Reading her, I feel like I’ve met her, that we’ve had some beers together, that I’ve been judgemental about her taste in men but didn’t want to say anything to her face, that I can’t keep up with her all night gaming sessions, but that I accept her for who she is even though we have very little in common. Whenever I hear that phrase “strong female character”, someone like Valentine is who I’ve been hoping meet. This review could be 100% about Valentine, and I’d still want to talk more about her. A lot of urban fantasies I’ve read, the goal is to save the city, or stop the bad magic, or solve the crime and catch the bad guy, or expose an evil plot, or some such. Yes, this does have a villain, and there are some crimes to investigate, but Flex is so much more intimate of a story. It’s about Paul trying to save his daughter. It’s about Valentine gaining acceptance. This is a book about finding your family, because you finally understand who you are. If you are a parent, you’ll see yourself in Paul. If you’ve ever felt like an outsider, or that you won’t be accepted for who you are, you’ll see yourself in Valentine. On the surface, this is one of those insanely fun, unputdownable books with some of the realest characters I’ve ever met. But peel away the layers of Paul, and Valentine, and Aliyah, and the pop culture references, and even the ‘mancy and you suddenly find yourself in a darkly honest story that is about how society handles what is outside our collective comfort zone. Everyone’s ‘mancy is unique, it’s not something we can categorize or label or fit neatly into a box, it is something that intimately defines that person. And since we don’t understand magic, our knee-jerk reaction is to fear, hate, and demonize it, instead of trying to understand it. You can put just about anything you want into that sentence in place of “magic”. So maybe this isn’t an urban fantasy at all. Maybe that’s just me wanting to force an ill-fitting label on something that confidently refuses to neatly fit into a useless box. Ferrett Steinmetz? the guy is a Wordmancer. 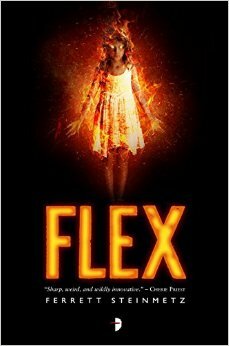 13 Responses to "Flex, by Ferrett Steinmetz"
Fascinating. I have a review copy of this one too, and it’s definitely on my reading list for March, though after reading this review, I kind of regret that I’m not able to get to it sooner! It really sounds like I’m going to enjoy it a lot! It is soooo good. I recommend pushing it up on your to-read pile. I kinda skipped right over this one when glancing at descriptions. A mistake it appears. Mancy is a funny word. yeah, a little. but it works in the book. I liked the way it was used in California Bones, too. This is the first review I’ve read of Flex and I’m even more excited to read it now! I may have to bump it up in the ARC queue! Awesome review! I skimmed this review because I’m reading it now. What I did see compared to what I’ve read is spot on, it is shaping up to be an incredibly fun and intense read. Love it so far! Sorry – think I was drunk – that should be ‘I’m’ and ‘review’ – doh – no more wine for me!!!! I just finished this and loved it! I was totally gripped. It was so good! I’m afraid I’m not very good at articulating why I just really enjoyed it and didn’t want to stop reading! I felt the same way…he’s a Wordmancer. This book really grabbed me, and is probably going to be one of my favorites for this year. So much fun. 7 | flex by ferrett steinmetz - We are book punks.We are book punks.